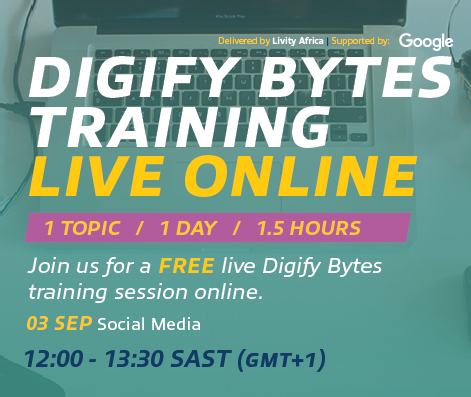 #DigifyBytes will be hosting this weekend’s instalment of their online digital marketing training sessions on Saturday 3rd September 2016 (tomorrow). The topic to be discussed during the FREE 1 hour 30 minutes session is Social Media Marketing. Digify Bytes is a one or two-day training programme aimed at giving thousands of young learners and job seekers a short, sharp shot of digital marketing skills. Delivered by young digital professionals, Digify Bytes is designed to open a new world of opportunities, where digital skills provide an advantage—both personally and professionally. Sessions are offered at no cost to participants or institutions that would like to host sessions for their students or youth participants. #DigifyBytes sessions are sponsored by Google and delivered by Livity Africa.